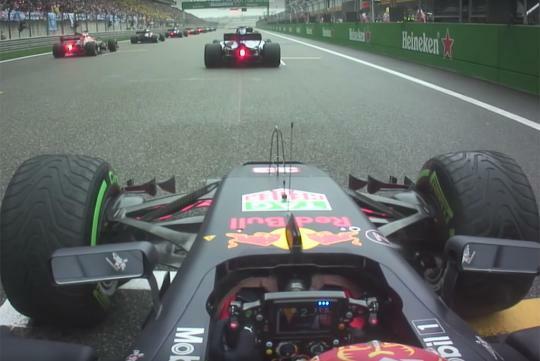 At the recent 2017 Chinese Grand Prix, 19-year old Max Verstappen Red bull driver made headlines when he overtook nine cars in the first lap of the damp track. He went from 16th to 7th on that opening lap. The talented young driver eventually finished third, behind Ferrari's Sebastian Vettel and Mercedes' Lewis Hamilton. Starting the race using second gear to limit wheelspin, he gets a great start and chooses a good line into turn 1, passing two cars. He then proceeds knock down rivals one by one on the rest of the lap by braking later than others and using a wider line. Watch the video for yourself and see how brilliant a driver he is! Try clicking the link in the video and watch it on YouTube. You can't watch it here due to copyright issues.